Protect your child's feet with shoes designed for the demands of growing bodies. Supporting the various movements that a child’s foot goes through as they run, jump and play is paramount to the development of our Kids Range. The entire line of ASICS sport and school shoes will keep kids feet well supported and free from discomfort whatever the activity. Help them hit the ground running with features that provide the following three key components. 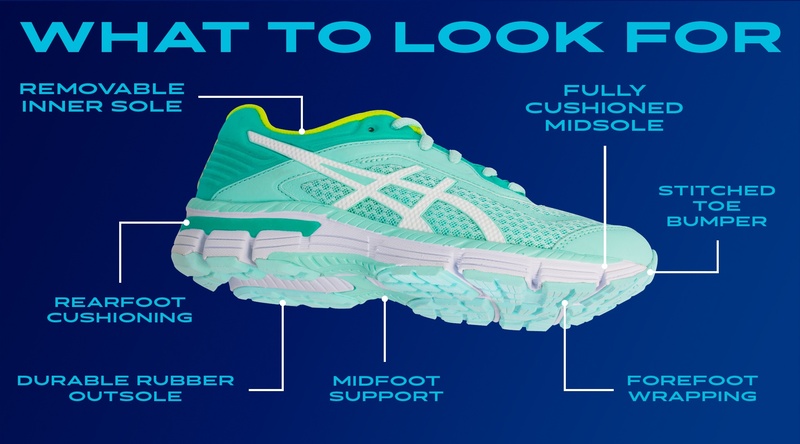 A firm heel counter across ASICS athletic shoes cups the foot and prevents unwanted movement. All shoes have a cushioned midsole for absorbing shock and softening repetitive forces that occur during activities. In our Football boots an HG10mm pitch ensures a cushioned landing, and places the child into the preferred take-off positioning. Kiwi Kids lead lifestyles that put their shoes through a range of tests. Our kids shoes are designed with durability at front of mind. Key features such as a stitched toe bumper and a solid rubber outsole that can stand up to tough surfaces like concrete, ensuring shoes last longer. Our Kids Footwear is designed to protect children as they go through their many phases of growth and activity. Emphasis is given across the range to reducing the shock on impact through rearfoot cushioning, aiming to alleviate growing issues such as Sever’s Disease. A high quality cushioned midsole is used to support the foot through it's full range of movement while remaining stable through the midfoot of the shoe. Sever’s disease is the most common cause of heel pain in pre-adolescent and adolescent children. It occurs most commonly in (but is not limited to) children between 7 -14 years of age and results from repetitive stress being placed on the growth plate of the calcaneus or heel bone. Over time this stress causes micro-trauma, inflammation and pain. To avoid Sever’s Disease look for shoes with a strong heel counter, firm support in the midsole and plenty of cushioning under the heel for good shock-absorbency. All ASICS kid’s shoes feature a heel gradient designed to stop the stress on the Achilles. Read more to see why ASICS has been a committed sponsor of this event for the past 7 years and how we are helping kids in New Zealand live a healthier lifestyle. Our ASICS ambassadors want to keep your kids moving this year. Check out the ASICS Movement Coach to receive personalised emails from their sporting heroes today. Sign up to our newsletter and be in to WIN ONE of THREE PAIRS of kids shoes. Register before May 1st to go in the draw. New ZealandCHANGE REGION The stripe design featured on the sides of the ASICS® shoes is a registered trademark of ASICS Corporation.